Home DOST Mayon Volcano PAGASA PHIVOLCS PHIVOLCS Bulletin Update for MAYON Volcano - 15 January 2018 1:30 P.M.
PHIVOLCS Bulletin Update for MAYON Volcano - 15 January 2018 1:30 P.M.
DOST-PHIVOLCS - MAYON VOLCANO BULLETIN (UPDATED) 15 January 2018 1:30 P.M. ALERT LEVEL 3: MAYON VOLCANO BULLETIN UPDATED as of 15 January 2018 1:30 P.M.
As per DOST-PHIVOLCS, Two lava collapse events occurred today at Mayon Volcano, Albay that produced rockfall and small-volume pyroclastic density currents. These occurred at 09:41 AM and 10:05 AM that lasted five (5) minutes and seven (7) minutes, respectively, based on seismic record. These events appear to have originated from the lava front and produced an ash cloud that drifted to the southwest sector. Ashfall were reported in Brgys. Travesia, Muladbucad Grande, Maninila, Masarawag, Poblacion, Iraya, Ilawod, Calzada, Inamnan Grande, Inamnan Pequeno, Maguiron, Quitago and Mauraro in the municipality of Guinobatan; Brgys. Cabangan, Anoling, Sua, Tumpa, Quirangay, Gapo, Sumlang, Brgys. 1 to 7, in the municipality of Camalig. A degassing event at 11:07 AM that lasted eight (8) minutes produced a grayish to dirty white ash column with a maximum of height of approximately 1000 meters above the summit before drifting west-southwest. Alert Level 3 remains in effect over Mayon Volcano, which means that it is currently in a relatively high level of unrest as magma is at the crater and hazardous eruption is possible within weeks or even days. The public is strongly advised to be vigilant and desist from entering the six (6) kilometer-radius Permanent Danger Zone (PDZ) and the 7-km Extended Danger Zone (EDZ) on the southern flanks due to the danger of rockfalls, landslides and sudden explosions or dome collapse that may generate hazardous volcanic flows. Increased vigilance against pyroclastic density currents, lahars and sediment-laden streamflows along channels draining the edifice is also advised. Civil aviation authorities must also advise pilots to avoid flying close to the volcano’s summit as ash from any sudden eruption can be hazardous to aircraft. Based on the seasonal wind pattern, ash fall events may most likely occur on the southwest side of the volcano. DOST-PHIVOLCS maintains close monitoring of Mayon Volcano and any new development will be communicated to all concerned stakeholders. 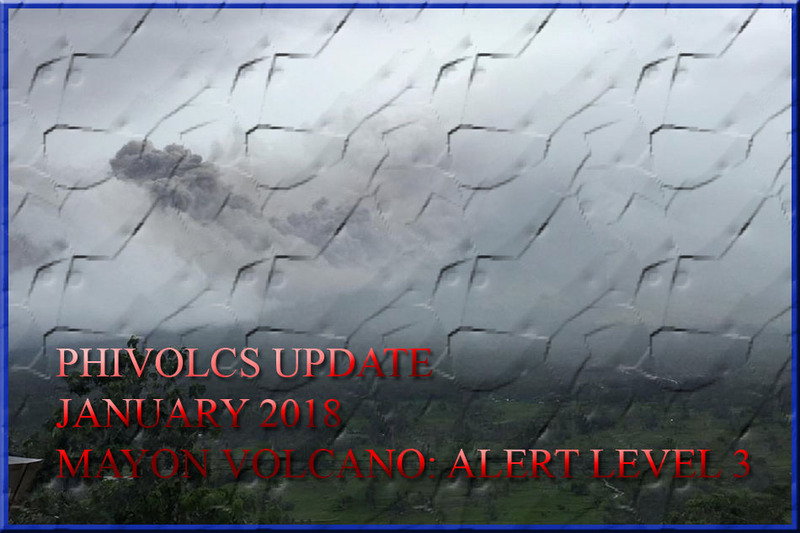 PHIVOLCS BULLETIN UPDATE FOR MAYON VOLCANO - 14 JANUARY 2018 8:00 PM. PHIVOLCS ADVISORY FOR THE JANUARY 14, 2018, M 7.1 EARTHQUAKE OFFSHORE SOUTHERN PERU.